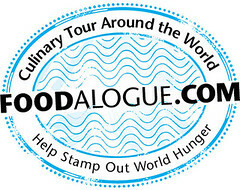 With the deadline fast looming, we were still debating whether or not we were able to make anything Ethiopian for FOODalogue's Culinary Tour of the World. A quick search online yielded a bunch of wats (stews), requiring both berbere (Ethiopian spice mix) and nit'r qibe (niter kibbeh; spiced butter). Yes, we could've made the berbere and nit'r qibe, but the ingredient lists looked so long. We did not really have the luxury of time, because when I said "deadline fast looming," I was talking about our daily deadline as well. When I got home, it was about 4:30-ish in the afternoon -- meaning, the sun was already on its way down the horizon, making any chance of photographing in natural light a very dim possibility indeed. So, I frantically tried to find a very easy recipe. 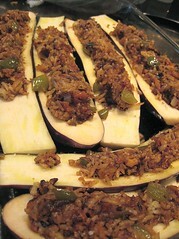 I found one on www.alleasyrecipes.com, no less, and it seems that the domain name doesn't lie, because this Eggplant with Dried Fruit Stuffing is as easy as it can be. The recipe even calls for the cooking to be done in the microwave! I adapted it for stovetop cooking. 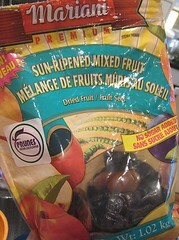 What makes the recipe even more fortuitously easy was the fact that we've had this bag of dried fruits lying around for a while now. Ignored; set aside. Finally, I can use them up. I started by sweating the aromatics in a little oil: onions, garlic and green peppers. I added the chopped dried fruits (peaches, apricots and prunes), along with some toasted ground almonds that we also happened to have lying around. The recipe called for white wine, but we didn't have any on hand, so I added a splash of cognac and some water. The lot was seasoned with cinnamon, cloves and paprika. After about a minute or so, the cooked rice went in. Being us, we of course almost always have cooked rice lying around. I stirred the mixture until everything was well-mixed. The dried fruit stuffing was done. And yes, we happened to have some eggplants lying around too! This is quite a rare incident. I used 3 Asian eggplants. I halved them and scooped out the interior, making boats. I rubbed a bit of olive oil onto the bottom of the baking pan and arranged the eggplant-boats in it. 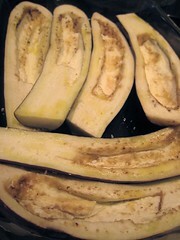 I drizzled a little bit more olive oil onto the bare eggplants and seasoned with salt. I stuffed the boats, covered the pan with foil, and placed it in a 350F oven. 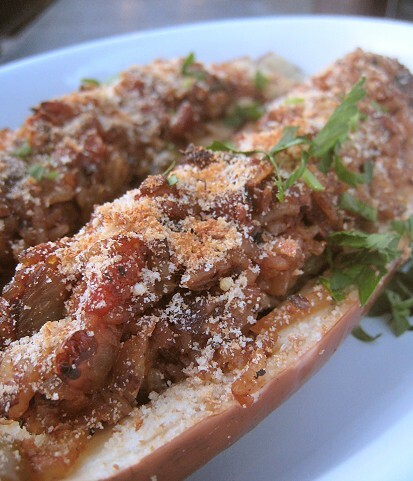 I thought it was smooth sailing from here on out and lovely pictures of my eggplant dish were going to be realized. Alas, this is where my momentum halted and the dish stalled. It took a while to cook these things! A few minutes after the sun had set, the dish was finally done. For texture, I topped the stuffing with some bread crumbs and drizzled a bit more olive oil. I broiled them to get a crispy topping, and then -- yes, for real -- they were finally done! This was actually really good! I'm not too big a fan of eggplant, but they really served well as vessels for the stuffing. This dish was very flavorful, truly more than the sum of its parts. Ah yes, the duck. I just found it amusing that this "Eggplant with Dried Rice Stuffing" recipe had, in its list of ingredients, "2 eggplants or 1 duck". But yes, this would be quite delicious inside duck... or even chicken. Must Will try. In a skillet, heat oil or butter over medium. 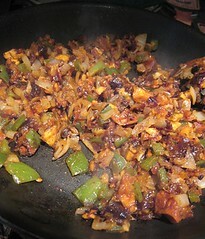 Add garlic, onion and green pepper, and cook until softened. Add dried fruits, nuts, wine or water, and spices: cinnamon, clove, paprika. Cook until the liquid has been absorbed, about 30 seconds. 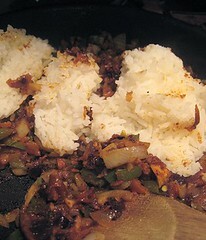 Add cooked rice and stir to mix well and until rice is heated through. Season with salt and pepper to taste. Set stuffing aside. Drizzle the bottom of a 9x13 baking pan with olive oil or melted butter. Arrange eggplant halves. Drizzle eggplants with olive oil and season with salt. 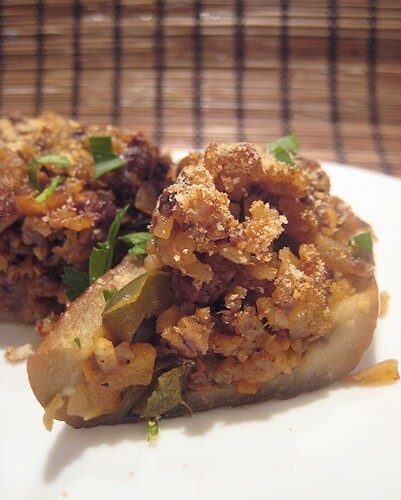 Stuff eggplants with the dried fruit stuffing. 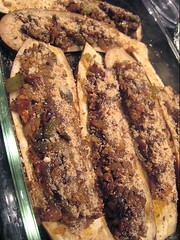 To finish, uncover the pan, sprinkle breadcrumbs over the stuffing and drizzle more olive oil. Place under broiler in the oven until crisp. Had I found this recipe, I definitely would have made it. It looks delicious. I went the Doro Wat way. Thanks for joining me in Ethiopia. P.S. It's good you did it in the oven -- more authentic than a micro! 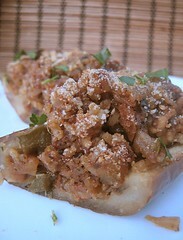 This looks delicious and a great way to enjoy eggplant! This sounds really easy and amazing! I love eggplants but have never thought of stuffing them. very nice! we did make the berbere and nitir kibbeh and, you are right, it was a long list and the spread we made ended up taking me about 5 hours to cook. so, my main point is you were smart! 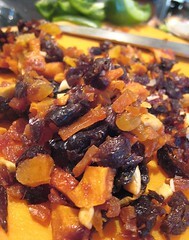 I love eggplant and dried fruit and the combination of spices sounds like they would compliment perfectly. Very nice recipe - and picture ! I was quite surprised at having found a microwave recipe! Thanks! We don't usually stuff things often. Hehe.